These look like a good bunch of books to have on my shelf! I love Books, The best gift to give!! Ready to go to Italy? Love it! Great collection! Would love to get my hands on these. 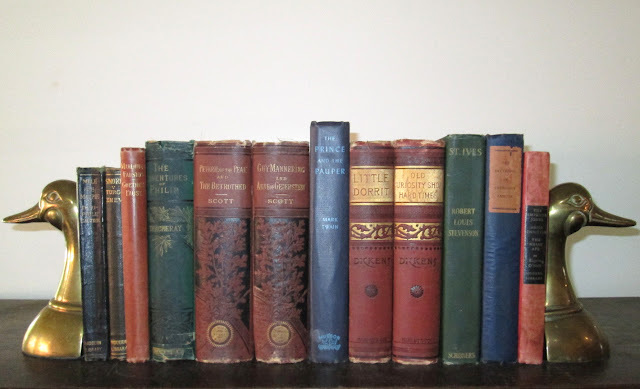 Hello Deborah, I have five of the Dickens books, but mine do not include Little Dorrit, or Old Curiosity Shop Hard Times and to top it all off, I have the same book ends. My brother, who knows how much I love to read, gave me the book ends about 30 years ago or more and I've always cherished them. I'd love these beautiful volumes. I would love to have these fabulous books! I would love to win these fabulous books! Good evening! I would love to have this collection! Thanks for the opportunity! Wonderful selection of some of my favorite authors! Another great selection to give away! Again, thanks for doing this every week! Those old classics are beautiful... would greatly enhance my bookshelves. It's been awhile since I won anything. Maybe it's my turn this time?